This easy potato soup recipe is the base for so many of my favorite soups. There is nothing like comfort food than a delicious bowl of homemade soup to warm you up. The loaded baked potato soup additions are endless. Add ham, turkey, chicken, bacon, cheese, green onion, vegetables, beef - create your own. Check out more homemade soup recipes at the end of the page, or the recipe categories at the left of the page. 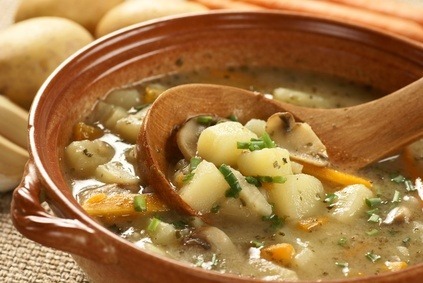 Combine the potatoes, celery, onion and water in a dutch oven or large saucepan. Bring to a boil, then cook over medium heat until potatoes are tender, about 10 to 15 minutes. Add the chicken base. If it is too weak tasting, add a little more base until it tastes perfect. Meanwhile, in a small saucepan, melt butter over medium heat. Whisk in the flour and cook for one minute. Slowly whisk in the milk and cook until thickened; approximately five minutes. Add the the potato mixture and cook until hot. Serve with crusty homemade bread and a crisp salad with homemade salad dressing. In a skillet, fry chopped bacon and onion until bacon is cooked and onion is tender. Remove and drain; set aside. In the same bacon fat, add the flour and whisk together until smooth. Gradually whisk in the broth, bring to a boil and mix for two minutes. Add the potatoes and half-and-half. Mix well until heated through. Top each serving with cheddar cheese, bacon and sour cream. Delish. I like to thicken it up and serve as a side dish to steak and chicken.